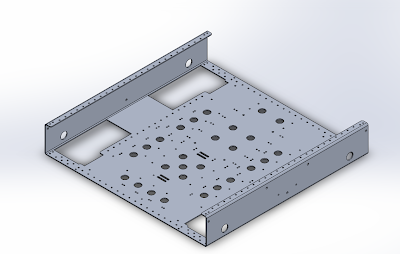 We finalized the CAD for the drive train today. We are cutting a heavy version for our practice bot that doesn't have a lot of holes that will be in the real version, which will save us some time. Here is the belly pan. It has mounting point for 16 victors/talons, and although we won't be using all of them, it's nice to know we have them. The prototype shooters still need some work but we have started designing the final version of our intake. It's heavily based on the intake rollers from VEX robots. We also will be able to outtake the ball from its stored position using only the rollers so we can score in the one point goal. We started construction on our bumpers yesterday. This year we are going to make our bumpers early and we are spending time to make sure they are done very well. Last year we had some issues with the pool noodles sagging a bit after a few competitions, but we don't think that will be a problem this year.